Macarons are French meringues made from almond flour, whose origin dates back to the Middle Ages. In France, bakeries and pastry shops produce a huge range of traditional macarons. Of all the variants, the colorful macaron made from two cookie disks with a cream layer is the most widely spread today. The meringue biscuit for the sandwich cookie is made from egg whites, icing sugar and very finely ground almonds and stained with colorful food extracts. The filling of the 3-5 cm Macarons usually consists of buttercream, ganache or jam in a huge variety of flavors. Under its very thin and smooth crust, the meringue ist soft, moist and melts quickly in the mouth. In contrast to normal cookies, macarons don’t last for long without taste loss and get hard within two to four days. Macarons are considered to be rather difficult to make, as the amounts of the different ingredients, the baking temperature, the baking time as well as rest periods have to be met precisely. The name “Macaron” comes from the Italian word (am)maccare, which means “to crush” or “to mash”. The Venetian word macarone or maccherone means thin or fine paste. Macarons are not to be confused with German coconut macaroons or the famous Italian pasta called macaroni. During the occupation of Sicily, Arab troops brought new foods such as lemons, rice and pistachios to Europe. Among them were many sweets based on nuts and filled with sweet almond cream. After their way through Italy, the Macarons were taken from Florence to France by Caterina de’ Medici. The special occasion was her marriage with the future King of France, Henry II, in 1533. The pastry chef of the royal court continued the culinary tradition of macarons as he also offered them at the wedding festivities of Louis XIV in 1660. However, at this time macarons were still plain biscuits from almond flour, sugar and egg white. Only in the 18th century, jam or cream was baked into the cookies before they were opened and filled with cream at an even later point of time. Marie Antoinette, the Queen of France, was a fan of the “new” Macarons and contributed to its triumphal procession. Now try this royal favorite for yourself! Separate the eggs and put the egg whites in a bowl. Whisk the egg whites with a pinch of salt but make sure that the bowl and the mixer is completely free from any grease. When the egg whites begin to change color, gradually besprinkle them with granulated sugar and continue whisking until stiff. Chop the almonds together with the icing sugar and then press both ingredients through a sieve. Gently mix the whipped egg whites with the almond-sugar mixture. Put the mixture in a piping bag and create individual macarons (approx. 3 cm in diameter) on a baking tray lined with baking paper. 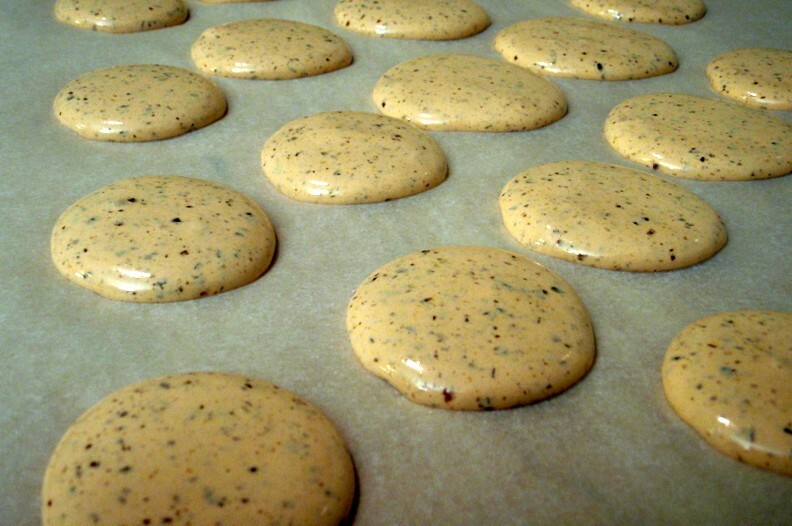 Before baking, let the macarons rest for about 15-30 minutes. This forms the important crust that keeps the moisture in the pastry and thereby prevents cracks in the surface. Now pre-heat the oven to 160 ° C and bake the macarons with bottom heat for about 15 minutes. They are ready when so-called "little feet" have formed on the bottom. Take the macarons out of the oven and move them together with the baking paper from the tray on to a slightly wet kitchen surface. The macarons absorb the water and can be easily taken off the paper after they have cooled down. Now place some flavored buttercream, ganache or simply jam on one meringue cookie and put another one on top. Be creative with the filling!